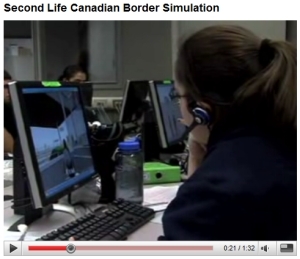 This video demos a pretty unexpected application of Second Life: a mixed reality simulation of border crossing encounters for students of the Canada Border Services Agency. In other words, training in the virtual world for the guarding of real world national borders. (Which come to think of it, are largely virtual too.) It's the brainchild of Loyalist College's Virtual World Design Centre, based in Ontario. The alternative to this SL-based, VOIP-enabled simulation of the US-Canadian border, I suppose, is a costly real world simulation (booth, working gate, actors, cars, etc.) Cost-saving, surely, but will the SL version train Canada's future border guards as effectively? I'm curious to see the success metrics. "2007 - Without using Second Life, student interview skills average grade: 58%. 2008 - after using Second Life simulation, student interview skills average grade: 86%." So a 28% improved result with the simulation. So there's a problem in US-Canada border crossings in RL with hair and shoes going up people's asses?